The Forest Hills Public Schools Mandarin immersion program is the first of its kind in West Michigan. The program began in 2008, bringing together Eastern and Western culture in order to provide a rich academic, linguistic, and cultural experience for students. Today, we celebrate the program’s growth with 400 students enrolled! Learners in grades K-4 experience a 50/50 One-Way Immersion Model. Upon entrance to grade five, the program shifts to an intensive Mandarin Language & Literacy Block, designed to build upon the K-4 base and further deepen oral speaking, listening, reading, and writing capacity in Mandarin. In the 2017-18 school year, students enrolled in the Forest Hills Public Schools Mandarin Chinese immersion program began working on their Chinese language college minor thanks to an agreement signed between FHPS and Western Michigan University Extended University Programs. The dual enrollment program is housed at Forest Hills Northern High School. Click here to read more about this partnership with WMU. 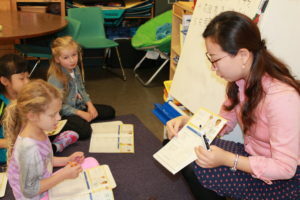 Mandarin Chinese Immersion Kindergarten Program Now Accepting Applications: Meadow Brook Elementary School has a limited number of spaces available for the Mandarin Chinese immersion kindergarten program for the upcoming school year. If you’d like to learn more about this program and/or would like to schedule a tour, please call 616-493-8740. The U.S. Department of State recognizes Mandarin Chinese as a “critical language” for Americans. In 2012, China became the second largest investor in research and development, behind the United States, and, for the first time, ahead of Japan. American companies seek opportunities to connect with the 1.3 billion-person market represented by China. Tonal languages like Mandarin Chinese develop a bilateral network between the left and right hemispheres of the brain. Mandarin Chinese is spoken by over 1 billion people around the world. Mandarin Chinese is among the most used languages on the Internet. Mandarin Chinese is a gateway to a rich culture with over 5,000 years of history. Language immersion is growing as a community of language learners. Language immersion is guided by the pillars of dual language immersion educational philosophy. Language immersion is grounded in our school district’s vision of all learners achieving individual potential. K-12 language immersion programming is designed intentionally to provide learners with time and intensity in a target language to encourage bilingualism and bi-literacy. Students experience daily core content instruction through the means of a target language. As part of this content instruction, students acquire skills unique to the target language, with the overarching goal of developing student performance and proficiency over time. This means that the language is not the sole content of instruction itself, but rather it serves as the vehicle through which content knowledge and skills are accessed and engaged. The Forest Hills Public Schools Mandarin Chinese Immersion Program was the first of its kind in West Michigan and has a record of success. The program began in 2008, and today we celebrate the program’s growth with over 350 students enrolled. The Mandarin Chinese Immersion Program begins at Meadow Brook Elementary School. Learners in grades K-4 experience a 50/50 oneway immersion model. This means that students spend 50 percent of their time in Mandarin Chinese, and 50 percent of their time in English. In the early grades, students are taught Mandarin Chinese by way of our reading and writing focus, math exploration and kindergarten experiences. Children participate in the kindergarten curriculum through developmentally-appropriate activities that encourage social, emotional, physical and intellectual growth. While immersion uses Mandarin Chinese as the vehicle for teaching some core content areas, we also focus on vocabulary development and embedded language-specific activities to build proficiency in Mandarin Chinese. Upon entrance to grade five, the program shifts to an intensive Mandarin language and literacy block, designed to build upon the K-4 base and further deepen speaking, listening, reading, and writing capacity in Mandarin. Students who continue through the program will attend Northern Trails 5/6 School, Northern Hills Middle School and eventually Northern High School. Recess, lunch, media center, computer lab, art, and physical education are incorporated. For more information about the Mandarin Chinese Immersion Program, including enrollment information, please click here. Or call Lisa Peabody at (616) 493-8740 or email her at lpeabody@fhps.net.